Maybe I should’ve known Aunt Carol’s house would be the hardest of all. Why? Because Aunt Carol is great. She is the kind of relative who not only bakes fourteen different kinds of cookies for the holidays, but she bakes enough to give every relative who’s in town a huge sampler plate of them to take home as well. She’s been known to make her own chocolates, and to decorate kid’s birthday cakes so elaborately they might do for a small wedding reception. I identify with Aunt Carol in this respect: food is an expression of love. And up until this year, I too brought a sweet gift for all the relatives that I had made in my kitchen… some years I brought homemade jams, others I made little cakes in canning jars. In the years when our kids were really small and making something myself wasn’t happening I brought locally-made gifts like maple sugar cotton candy and maple cream spread. Sensing a theme here? If food can equal love, than I guess sugar can equal Christmas. Because of this, I always knew the holidays would represent our greatest sugar challenge. This year we are spending them in Michigan with my husband’s extended family, as we do every other year. A good eleven-hour drive from home, this area is a suburban ocean between the city-shores of Toledo and Detroit, and there’s just a lot more of everything here: people, convenience stores, fast food restaurants, chain restaurants, billboards, freeways, parking lots, sirens… coming from our little Vermont town of a thousand residents the contrast can create culture whiplash. Then again, there’s more variety here too: we can’t get authentic Greek or Lebanese or Indian food in Vermont, but we can get it here. But back to Aunt Carol. Since long-before I ever happened upon the scene, my husband’s family has been getting together to exchange gifts on Christmas Eve. This year Aunt Carol had volunteered to host again so we all arrived in our Christmas coats and fancy shoes at 6:05 on the dot. Immediately, it was a problem. Greta took one look at the usual spread- cookies on the counter, fudge in a pretty glass basket, local Dietsch’s chocolate samplers open on the sideboard- and quickly came to the conclusion that this was going to be the worst Christmas ever. Ilsa- by comparison, is easy. She asks, “Can I have this?” and when the inevitable answer is no, she shrugs it off and runs off to go play. It may be that Greta just has a bigger sweet tooth, but more likely I think is the possibility that she has a pre-teenager’s burgeoning need for independence and to make her feelings known by all in the immediate vicinity. She, unlike Ilsa, spent a good portion of her Christmas Eve pouting and making meaningful, tragic faces in my direction. Dinner wasn’t much easier. As she has other years, Aunt Carol had lovingly and graciously provided a buffet for all of us, and, ungrateful wretch that I am, I couldn’t eat most of it. There was store-bought pulled pork and chicken, white and whole-wheat buns, baked beans, applesauce… of course, sugar to one degree or another in all of it. I don’t know if it was intended for our benefit, but I was extremely, extremely grateful for the one large tray of mac and cheese that evening… if not for that we would’ve been stuck eating olives for dinner and I’m pretty sure Greta would’ve gotten enough mileage out of that to extend her extreme pout-fest well into her thirties. None of the relatives said much about the sugar project, probably because they think I’m loopier than the Cocoa Puffs bird for talking my family into it in the first place. But they all were nice enough to ask about my recent health issues, so I guess they still like me. And then, thankfully, the present opening began. Greta and Ilsa were fully diverted for the remainder of the evening opening gifts, trying things on, helping the babies and toddlers, and creating a Bionicle masterpiece with cousin Donovan. That sour, Grinchy frown disappeared from Greta’s face, and it was replaced by the happiness of being a kid at Christmas. Thank God. 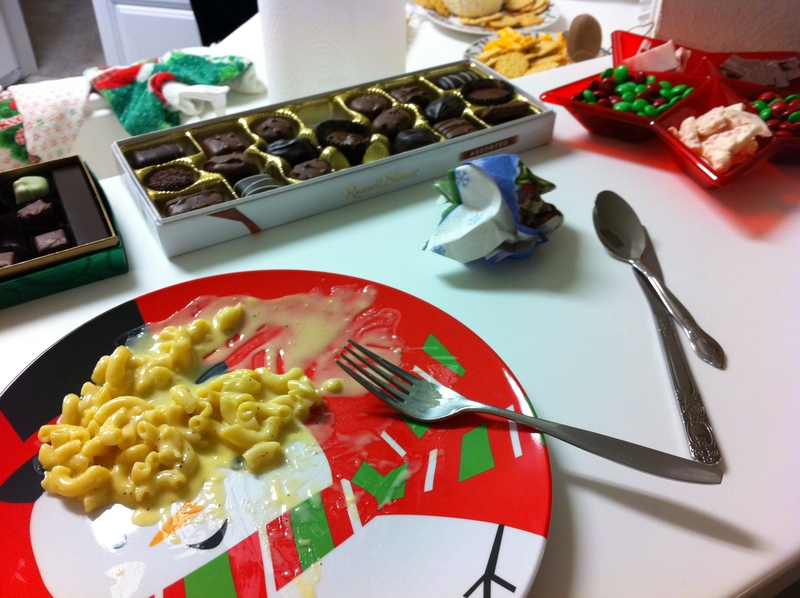 Granted, eating right next to a plate of forbidden chocolates and cookies on Christmas Eve isn’t ideal. But it was, I think, the biggest challenge we’ve had all year, and we survived it. I’m proud of that- and proud of my family. And profoundly grateful for them. A good way to feel on Christmas, I think. So what did I bring this year? 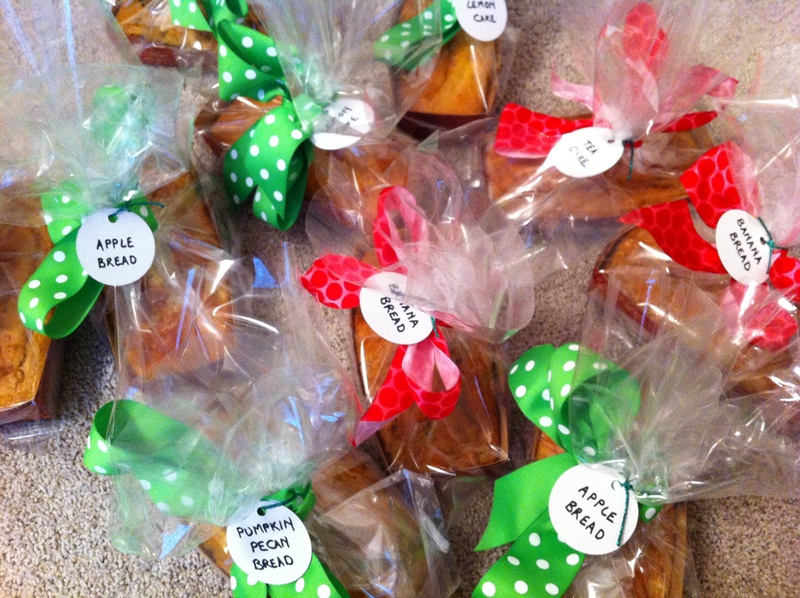 Sweet things from my kitchen, of course! Over the past few weeks I’ve been experimenting with “quick breads” of all kinds- banana, apple, pumpkin pecan… all made with no fructose; just fruit and good old dextrose. I wonder if anyone will notice. You are currently reading A Year Of No Sugar: Post 92 at Eve O. Schaub.